Solo, the second Star Wars Story released in theaters, is flying home on Blu-ray and DVD this month. And to celebrate, the Honest Trailers team have pulled out their fists and baseball bats to give it a nice purple hue around the ribcage as they beat it out of their memory, gleefully kicking the Star Wars franchise while it's down. Despite boycotts, bad reviews, backlash and a lot of fan hate, as Solo prepares for its home landing, the general consensus seems to be that it's actually pretty good. As the Honest Trailers crew even admits, it's neither bad nor great. It's just ok. The narrator prepares audiences for a new kind of Star Wars movie. One fans will forget as soon as they're home from the theater. Which is a little harsh in this post-Last Jedi climate. A lot of fans are showing their love for this sci-fi adventure that finally reveals Han Solo and Chewbacca's origins. Though, that concept seems to be the biggest problem here. This latest Solo dissection goes after Lucasfilm for reshooting more than half the movie, after they already did that whole scenario on the first Star Wars Story Rogue One. They don't attack Alden Ehrenreich's acting, instead calling him the blandest thing in this prequel spinoff. Which is actually on target. The movie gets called less a Han Solo character study and more of a Han Solo origin story for all of his accessories, including his gun, his ship, his favorite comeback, and his iconic golden dice. Seriously, what is up with those dice? They used to just be a bit of set dressing, now they're one of the most important things in the Han Solo legacy? The trailer also goes after the origin of Han's last name. Apparently he didn't have one. When he joined the Imperial military, they gave him one. Solo. Because he doesn't have a tribe or a family. He's all alone in space. That is pretty goofy, and we definitely didn't need that moment as fans, so some of what we see in Solo definitely needs to get the boot. Solo made its VOD debut on September 14, before coming home this week on September 25. The Solo Blu-ray release comes jam packed with new special features, including a director and cast roundtable that offers a sneak peek into the trouble production process without really divulging anything too scandalous that fans didn't already know. There are also 8 deleted and extended scenes that help flesh out the story a little more. These aren't nearly as awful as the deleted scenes from The Last Jedi, which were nearly unwatchable. 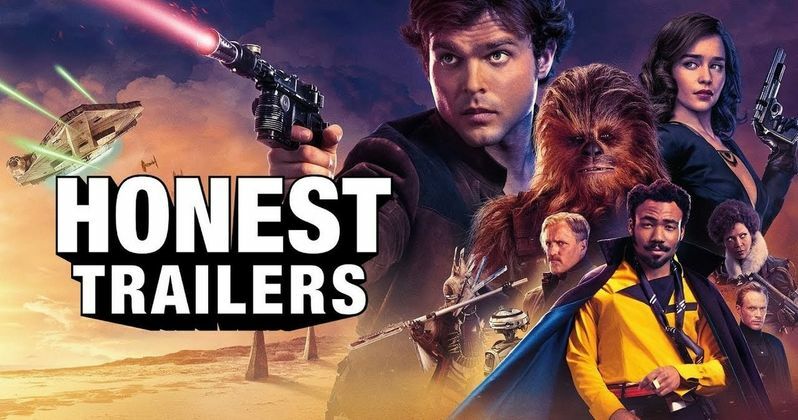 Check out the Honest Trailer for Solo, which probably won't change the way you feel about the movie. You're either on board for this quick space diversion that is pretty harmless, or you hate what Star Wars has become. Either way, the franchise will continue to plod along.